This year I decided to switch to synthetic motor oil for my outdoor power equipment. 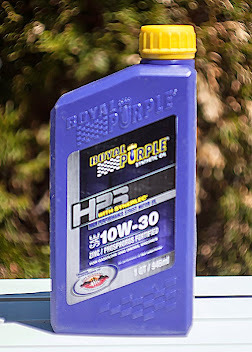 After reading a ton of great reviews I decided to go with Royal Purple Synthetic oils. 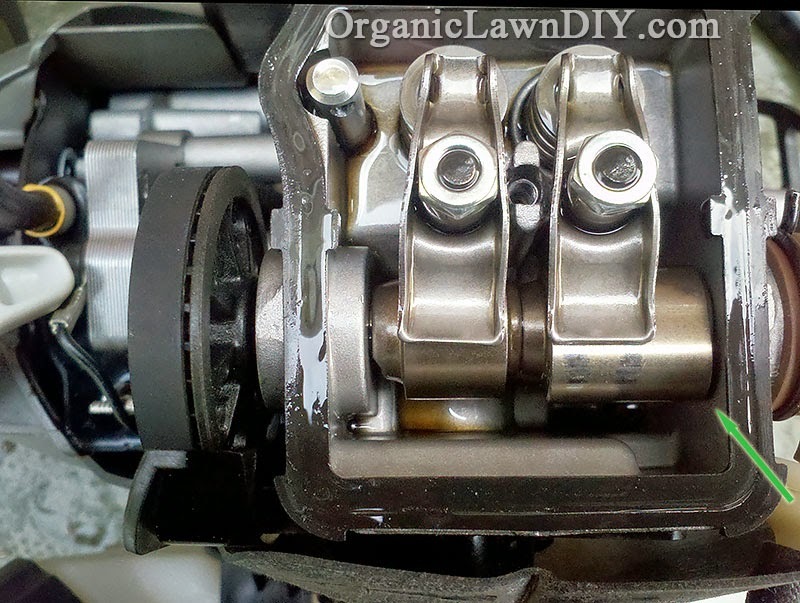 This morning my Ryobi 4-cycle string trimmer head (RY34426) did something it's never done before. My C430 started on the first pull after filling it up with Royal Purple HPS 10W-30 Synthetic Oil ! I've had the 4-Cycle trimmer since last year and it's always been a bit of a struggle to start. Sometimes it would take a dozen pulls to get it going but normally 3 or 4. I'd usually have to prime the engine twice. The last time I ran the engine was two weeks ago to warm it up before draining the old oil. That was the first time I ran it since last spring and it took at least 6 pulls to get it going. I've been waiting on a replacement air cap that I lost so the trimmer has sat idle since then. The engine was running so well I didn't even bother to change the spark plug, which I initially thought was the cause of the slow starts. Spark plug looked good and didn't have a lot of hours on it so it stayed in. Amazing what a difference better oil can make! Earlier this spring I ordered a quart of Royal Purple API 10W-30 Synthetic Oil which I planned to use in my lawn mower and trimmer until I sent an email to Royal Purple asking what they thought about using their synthetic oil in small engines like on my mower, trimmer and snow blower. Most of the good things I read about Royal Purple oil came from people using it in their cars, so I wanted to be sure. The first email I received from Royal Purple taught me a lot about engine oil. They seem to know their stuff. They told me the API oil would work but they recommended their HPS oil instead. The API licensed oil needs to meet certain requirements for warranty compliance in new automobiles. Most of it has to do with preserving the life of the catalytic converter (but compromises wear performance) from what I understand. The HPS oil is their no-compromises formula. The API oil is still a good oil. After Royal Purple agreed to send me some of their HPS oil to review (yay free stuff!) I gave the API oil I bought to my uncle. After filling up his mower with Royal Purple API he was also pleasantly surprised to see his mower fire up on the first pull after sitting idle in a cold shed all winter. It's been running great ever since. Out of all the good I read about Royal Purple (and sometimes lukewarm or negative things.. people get really passionate about oil, you'd think they were talking about something important like lawns!) one picture on a Mustang forum really swayed my decision. 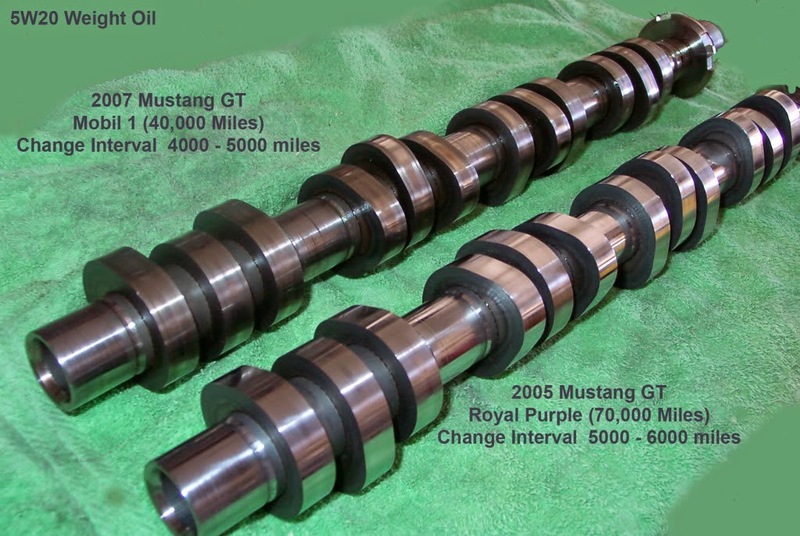 Below is a picture of two camshafts from two different Mustang GT's. One used Mobil 1 Synthetic Motor Oil while the other used Royal Purple Synthetic Motor Oil. Even though the Royal Purple camshaft had almost twice as many miles, it looked brand new compared to the other. That was enough to get me to switch from conventional motor oil to Royal Purple Synthetic. Based on what I saw while tuning up my C430 trimmer I wish I would have switched sooner. The camshaft of my RY34426 trimmer is already looking a little shabby after just one season using the recommended 20w30 conventional motor oil. One of the lobes has some noticeable wear on it. I'll discuss it more when I post a review later but here's a picture. According to the manual any motor oil that meets or exceeds API service classification SJ in either SAE30, 10W30 or 10W40 can also be used in addition to 20W30. I decided to go with the 10W30 which the manual recommends for my mower. The trimmer only uses a couple of ounces which leaves plenty left over for the mower. Royal Purple HPS costs a little more than conventional motor oil but since it's only one quart between my mower and trimmer it's not a big deal. It's also available with free prime shipping from Amazon so I don't have to hunt around for it. Solving the problem of my RY34426 being hard to start alone is worth it. The longer life I should get out of the trimmer from the better cooling, better detergents and decreased wear from using Royal Purple Synthetic are also a big plus. Funny I just bought Royal Purple for the same trimmer but was looking for information before using it. This article fit the bill perfectly. Thanks for the writeup! What does the brand of oil have anything to do with how the engine starts? I'm not 100% sure and to be honest it took me by surprise. I went with Royal Purple HPS because of the Synerlac additive which is supposed to create a film on components to keep them lubricated even if there's no oil present. Thought this would be good for these engines since the go about a week or more between uses. If you look at the picture I posted of the camshaft, that whole compartment doesn't contain a reservoir of oil. It gets pumped into it when the string is pulled or when the engine is running and then it drains out and gets pumped back in. My best guess is that since the Synerlac keeps the parts lubricated even if the oil has drained out of that area and it has been dry for days, the components move more easily which makes it easier to start. Pulling the start cord feels easier. I got a well used husqvarna 224L from Dad and put it to work on the 5 apartment complexes I maintain. It was never meant to be a primary weed eater, I was just in a pinch. Great machine, it started running horribly(fuel filter) fixed it and it ran great. After reading this article I switched to royal purple oil and it runs better!After i ran the oil through for 5 minutes or so, I shut it off and it started on HALF a pull! It normally takes 2 from cold, now 1 or "less." Maintaining 4 weed eater engines at 50 hours oil change intervals and a single quart will easily last all season. The couple dollars is worth it to me. I believe in overkill with my equipment because it is my liveleyhood. Noticeable difference. I plan on changing oil after she goes on a full cycle of cutting, then running gas dry and putting her on backup duty.